The following sessions and events at CAA’s 104th Annual Conference, taking place February 3–6, 2016, in Washington, DC, are free and open to the public. Everything takes place at the Washington Marriott Wardman Park Hotel. CAA has announced the recipients of the 2016 Awards for Distinction, which honor the outstanding achievements and accomplishments of individual artists, art historians, authors, conservators, curators, and critics whose efforts transcend their individual disciplines and contribute to the profession as a whole and to the world at large. CAA will formally recognize the honorees at a special awards ceremony to be held during Convocation at the 104th Annual Conference in Washington, DC, on Wednesday evening, February 3, 2016, 5:30–7:00 PM. Led by DeWitt Godfrey, president of the CAA Board of Directors, the awards ceremony will take place in the Marriott Ballroom, Salon 2, Lobby Level, Washington Marriott Wardman Park. Convocation and the awards ceremony are free and open to the public. The Washington Marriott Wardman Park is located at 2660 Woodley Road NW, Washington, DC 20008. The 2016 Annual Conference—presenting scholarly sessions, panel discussions, career-development workshops, a Book and Trade Fair, and more—is the largest gathering of artists, scholars, students, and arts professionals in the United States. For more information on the 2016 Awards for Distinction, please contact Emmanuel Lemakis, CAA director of programs. Visit the Awards section of the CAA website to read about past recipients. CAA offers Annual Conference Travel Grants to graduate students in art history and studio art and to international artists and scholars. In addition, the Getty Foundation has funded the fifth year of a program that enables applicants from outside the United States to attend the 104th Annual Conference in Washington, DC, which takes place February 3–6, 2016. Applicants may apply for more than one grant but can only receive a single award. The CAA-Getty International Program, generously supported by the Getty Foundation, provides funding to fifteen art historians, museum curators, and artists who teach art history to attend the 2016 Annual Conference. The grant covers travel expenses, hotel accommodations for eight nights, per diems, conference registrations, and one-year CAA memberships. Extended deadline: August 26, 2015. CAA will award a limited number of $250 Graduate Student Conference Travel Grants to advanced PhD and MFA graduate students as partial reimbursement of travel expenses to attend the 2016 Annual Conference. To qualify for the grant, students must be current CAA members. Successful applicants will also receive a complimentary conference registration. Deadline: September 18, 2015. CAA will award a limited number of $500 International Member Conference Travel Grants to artists and scholars from outside the United States as partial reimbursement of travel expenses to attend the 2016 Annual Conference. To qualify for the grant, applicants must be current CAA members. Successful applicants will also receive a complimentary conference registration. Deadline: September 18, 2015. CAA’s Annual Conference Travel Grants are funded solely by donations from CAA members—please contribute today. Charitable contributions are 100 percent tax deductible. CAA extends a warm thanks to those members who made voluntary contributions to this fund during the past twelve months. CAA has begun accepting nominations for the 2016 awards. Please review the guidelines below to familiarize yourself with the nomination process and to download, complete, and submit the requested materials. Deadline: July 31, 2015, for the Charles Rufus Morey Book Award, the Alfred H. Barr Jr. Awards, and the Frank Jewett Mather Award; August 31, 2015, for all others. In your letter, state who you are; how you know (of) the nominee; how the nominee and/or his or her work or publication has affected your practice or studies and the pursuit of your career; and why you think this person (or, in a collaboration, these people) deserves to be recognized. We also urge you to contact up to five colleagues, students, peers, collaborators, and/or coworkers of the nominee to write letters; no more than five letters are considered. Letters of support are important for reference, but the awards decisions are the responsibilities of the juries based on their expert assessment of the qualifications of the nominees. Nominations for book and exhibition awards should be for authors of books published or works exhibited or staged between September 1, 2014, and August 31, 2015. Books published posthumously are not eligible. Letters of support are not required for the Mather, Morey, and Barr awards. All submissions must include a completed 2016 nomination form and one copy of the nominee’s CV (limit: two pages); book-award nominations do not require a CV (see below for the appropriate forms for the Mather, Morey, and Barr awards and the Porter prize). Please submit copies of critical writings, which may be website links and printouts, photocopies or scanned pages of newspapers or magazines, and more. If the writing is contained in a single volume (such as a book), please provide the publication information. In addition, complete and submit the Mather nomination form. To give the jury full opportunity to evaluate each submission fairly, submit materials well before the July 31 deadline. Letters for these two awards are particularly important for the juries because of the personal contact involved in successful teaching. To determine eligibility, authors of articles in The Art Bulletin must complete the Porter nomination form. Please write to Emmanuel Lemakis, CAA director of programs, for more information about the nomination process. The deadline to propose a Poster Session passed on Friday, May 8, 2015. CAA invites individual members to submit abstracts for Poster Sessions at the 104th Annual Conference, taking place February 3–6, 2016, in Washington, DC. Poster Sessions—presentations displayed on bulletin boards by an individual for small groups—usually include a brief narrative paper mixed with illustrations, tables, graphs, and similar presentation formats. The poster display can intelligently and concisely communicate the essence of the presenter’s research, synthesizing its main ideas and directions. Colorado State University has published useful general information on Poster Sessions. Poster Sessions offer excellent opportunities for extended informal discussion and conversation focused on topics of scholarly or pedagogical research. Posters are displayed for the duration of the conference, so that interested persons can view the work even when the presenters are not physically present. Poster Sessions take place in a high-traffic area, in close proximity to the Book and Trade Fair and conference rooms. Proposals are due by Friday, May 8, 2015—the same deadline as the regular call for papers for the 2016 conference. Send all materials to Lauren Stark, CAA manager of programs. A working group of the Annual Conference Committee selects Poster Sessions based on individual merit and space availability at the conference. Accepted presenters must maintain their memberships through the conference. Displays must be assembled by 10:00 AM on Thursday, February 4, and cleared by 2:00 PM on Saturday, February 6. Live presentations last ninety minutes and are scheduled during the lunch breaks on Thursday and Friday, 12:30–2:00 PM. During this time, presenters stand by their poster displays while others view the presentation and interact with the presenters. CAA assigns presenters one freestanding bulletin board (about 4 x 8 feet of display space) onto which they can affix their poster display and other materials, as well as a table to place materials such as handouts or a sign-up sheet to record the names and addresses of attendees who want to receive more information. CAA also provides pushpins or thumbtacks to attach components to the bulletin board on the day of installation. Printed materials must be easily read at a distance of four feet. Each display should include the title of the presentation (104-point size) and the name of the presenter(s) and his or her affiliation(s) (72-point size). CAA recommends a point size of 16–18 or larger for body text. No electrical support is available in the Poster Session area; you must have your own source of power (e.g., a battery). For more information about proposals of Poster Sessions for the 2016 Annual Conference, please contact Lauren Stark, CAA manager of programs, at 212-392-4405. The deadline to propose a paper or presentation passed on Friday, May 8, 2015. The 2016 Call for Participation for the 104th Annual Conference, taking place February 3–6, 2016, in Washington, DC, describes many of next year’s programs sessions. CAA and the session chairs invite your participation: please follow the instructions in the booklet to submit a proposal for a paper or presentation. This publication also includes a call for Poster Session proposals and describes the Open Format Sessions. Listing more than one hundred panels, the 2016 Call for Participation is only available as a PDF download; CAA will not mail hard copies of this twenty-four-page document. The deadline for proposals of papers and presentations for the DC conference is Friday, May 8, 2015. In addition to dozens of wide-ranging panels on art history, studio art, contemporary issues, and professional and educational practices, CAA conference attendees can expect participation from many area schools, museums, galleries, and other institutions. The Washington Marriott Wardman Park is the conference headquarters, holding most sessions, Career Services, the Book and Trade Fair, ARTspace, special events, and more. Deadline: Friday, May 8, 2015. For more information about proposals of papers and presentations for the 2016 Annual Conference, please contact Lauren Stark, CAA manager of programs, at 212-392-4405. 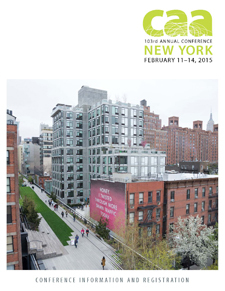 CAA wishes to thank the artists, scholars, curators, critics, educators, and other professionals in the visual arts who generously served as Career Services mentors—for the Artists’ Portfolio Review, Career Development Mentoring, the Mock Interviews, and the Professional Development Roundtables—during the 2015 Annual Conference in New York. CAA also appreciates the work of leaders of the Professional-Development Workshops and speakers at Orientation. Susan Altman, Middlesex County College; Michael Aurbach, Vanderbilt University; and Jo-Ann Morgan, Western Illinois University. Virginia Fabbri Butera, College of Saint Elizabeth; Michael Bzdak, Johnson & Johnson; Susan Canning, College of New Rochelle; Brian Curtis, University of Miami; Peter Kaniaris, Anderson University; Jason Lahr, University of Notre Dame; Matthew LaRose, Park University; Preston B. Lawing, Saint Mary’s University of Minnesota; Suzanne Lemakis; Sharon Lippman, Art Without Walls; Craig Lloyd, College of Mount St. Joseph; Judith Pratt, Judith Pratt Studio; Habibur Rahman, Claflin University; Steve Teczar, Maryville University of St. Louis; and David Voros, University of South Carolina. Susan Altman, Middlesex County College; Frances Altvater, University of Hartford; Michael Aurbach, Vanderbilt University; Brian Bishop, Framingham State University; Colin Blakeley, Eastern Michigan University; Karen Carter, Kendall College of Art and Design, Ferris State University; Leda Cempellin, South Dakota State University; Jaia Chen, Shelton State Community College; Kevin Concannon, Virginia Polytechnic Institute and State University; Anne D’Alleva, University of Connecticut; Rebecca DeRoo, Rochester Institute of Technology; James Farmer, Virginia Commonwealth University; Joan Giroux, Columbia College Chicago; Reni Gower, Virginia Commonwealth University; Jim Hopfensperger, Western Michigan University; Dennis Ichiyama, Purdue University; Carol Krinsky, New York University; Elisabeth Leach; Heather McPherson, University of Alabama, Birmingham; Jo-Ann Morgan, Western Illinois University; Jeff Nathanson, Arts Council of Princeton; Niki Nolin, Columbia College Chicago; Mark O’Grady, Pratt Institute; Christopher Olszewski, Savannah College of Art and Design; Morgan Paine, Florida Gulf Coast University; Doralynn Pines, Metropolitan Museum of Art, retired; Judith Pratt, Judith Pratt Studio; David Raizman, Drexel University; Jack Risley, University of Texas at Austin; Dinah Ryan, the Principia; Paul Ryan, Mary Baldwin College; Gerald Silk, Tyler School of Art, Temple University; Andrew Jay Svedlow, University of Northern Colorado; Joe A. Thomas, Zuckerman Museum of Art, Kennesaw State University; Larry Thompson, Samford University; Ann Tsubota, Raritan Valley Community College; Philip Van Keuren, Southern Methodist University; and Barbara Yontz, St. Thomas Aquinas College. Michael Aurbach, Vanderbilt University; Brian Curtis, University of Miami; Dennis Ichiyama, Purdue University; Peter Kaniaris, Anderson University; and Leo Morrissey, Georgian Court University. Dina Bandel, Virginia Commonwealth University, Qatar; Colin Blakely, Eastern Michigan University; Maria Ann Conelli, Brooklyn College, City University of New York; Jacqueline Coutré, Queens University; Stephanie Dickey, Queens University; Adam Fung, Texas Christian University; Carol Garmon, University of Mary Washington; Joann Giroux, Columbia College Chicago; Bertha Gutman, Delware County Community College; Kim Hartswick, Brooklyn College, City University of New York; Rebecca Harvey, Ohio State University; Richard Heipp, University of Florida; Heidi Hogden, University of South Dakota; David Howarth, Zayed University; Eldred Hudson, University of North Carolina, Charlotte; Dennis Ichiyama, Purdue University; Matt King, Virginia Commonwealth University; Andrea Kirsch, Rutgers University; David LaPolambara, Ohio University; Brittany Lockard, Wichita State University; Carolyn Martin; Tamryn McDermott; Jo-Ann Morgan, Western Illinois University; Thomas Post, Kendall College of Art and Design; Lauren Puzier, Sotheby’s Institute of Art; David Yager, University of California, Santa Cruz; and Megan Koza Young, Prospect New Orleans. Leda Campellin, South Dakota State University; Maria Ann Conelli, Brooklyn College, City University of New York; Jacqueline Coutré, Queens University; Lauren Grace Kilroy-Ewbank, Brooklyn College, City University of New York; Brittany Lockard, Wichita State University; Carolyn Martin; Tamryn McDermott; Lauren Puzier, Sotheby’s Institute of Art; Georgia Strange, University of Georgia; and Megan Koza Young, Prospect New Orleans. Susan Altman, Middlesex County College; Michael Aurbach, Vanderbilt University; Barbara Bernstein, Virginia Center for the Creative Arts and University of Virginia; Steven Bleicher, Coastal Carolina University; Mika Cho, California State University, Los Angeles; Curtis Fletcher, University of Southern California; Amanda French, George Mason University; Gigi Rosenberg; and Blaise Tobia, Drexel University. CAA has announced the recipients of the 2015 Awards for Distinction, which honor the outstanding achievements and accomplishments of individual artists, art historians, authors, conservators, curators, and critics whose efforts transcend their individual disciplines and contribute to the profession as a whole and to the world at large. CAA will formally recognize the eleven honorees at a special awards ceremony to be held during Convocation at the 103rd Annual Conference in New York, on Wednesday evening, February 11, 2015, 5:30–7:00 PM. Led by DeWitt Godfrey, president of the CAA Board of Directors, the awards ceremony will take place in the Hilton New York Midtown’s East Ballroom. Convocation and the awards ceremony are free and open to the public. The Hilton New York Midtown is located at 1335 Avenue of the Americas (Sixth Avenue), New York, NY 10010. The 2015 Annual Conference—presenting scholarly sessions, panel discussions, career-development workshops, a Book and Trade Fair, and more—is the largest gathering of artists, scholars, students, and arts professionals in the United States. For more information on the 2015 Awards for Distinction, please contact Emmanuel Lemakis, CAA director of programs. Visit the Awards section of the CAA website to read about past recipients. CAA has published Conference Information and Registration, which provides important details, instructions, and deadlines for attending and participating in the 2015 Annual Conference, as an online flipbook. The thirty-five-page publication is hosted by Issuu, a popular digital-publishing platform. Those wanting a printable version of the booklet can download a PDF. This is the first year that Conference Information and Registration is an online-only publication; CAA members will not receive hard copies in the mail. Following sections on registration and CAA membership, Conference Information and Registration describes travel, lodging, and transportation options and explains the basic processes for candidates seeking jobs and employers placing classifieds and renting booths and tables in the Interview Hall. In addition, the publication lists topics for nine Professional-Development Workshops. If you want to connect with former and current professors and students, consult the Reunions and Receptions page. The booklet includes forms for CAA membership, conference registration, workshops, special events, and mentoring enrollment. The contents of Conference Information and Registration also appear on the conference website, which is being updated regularly between now and the February meeting. There you may also join CAA or renew your membership before registering online. 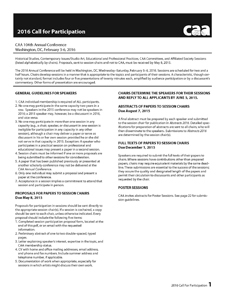 The CAA 104th Annual Conference will take place February 3–6, 2016, in Washington, DC. The Annual Conference Committee invites session proposals that cover the breadth of current thought and research in art, art and architectural history, theory and criticism, pedagogical issues, museum and curatorial practice, conservation, and developments in technology. Deadline: Friday, September 12, 2014. In order to submit a proposal, you must be a current CAA member. For full details on the submission process for the conference, please review the information published below. This category encourages experimental and alternative formats that transcend the traditional panel, with presentations whose content extends to serve the areas of contemporary issues, studio art, historical studies, and educational and professional practices. Proposals may experiment with session hierarchies, length, technology, and modes of participation. Open Formats are the only sessions that may be preformed, with participants chosen in advance by session chairs. These sessions require advance planning by the chair. This category broadly embraces all art-historical proposals up to the third quarter of the twentieth century. Historical Studies session proposals may not be submitted as preformed panels with a list of speakers. This category is intended for studio-art proposals, as well as those concerned with contemporary art and theory, criticism, and visual culture. Contemporary Issues/Studio Art session proposals may not be submitted as preformed panels with a list of speakers. This category pertains to session proposals that develop along more practical lines and address the educational and professional concerns of CAA members as teachers, practicing artists and critics, or museum curators. Educational and Professional Practices session proposals may not be submitted as preformed panels with a list of speakers. Each CAA affiliated society may submit one proposal that follows the guidelines outlined b elow. A letter of support from the society or committee must accompany the submission. The Annual Conference Committee considers it, along with the other submissions, on the basis of merit. Each CAA committee may submit one proposal that follows the guidelines outlined below. A letter of support from the society or committee must accompany the submission. The Annual Conference Committee considers it, along with the other submissions, on the basis of merit. The committee makes its selection solely on the basis of merit. Where proposals overlap, CAA reserves the right to select the most considered version or, in some cases, to suggest a fusion of two or more versions from among the proposals submitted. The submission process must be completed online. Deadline: Friday, September 12, 2014. The process of fashioning the conference is a delicate balancing act. The 2016 program is shaped by four broad submission categories: Open Formats, Historical Studies, Contemporary Issues/Studio Art, and Educational and Professional Practices. Also included in the mix are sessions by CAA’s affiliated societies and committees. The Annual Conference Committee welcomes session proposals from established artists and scholars, along with those from younger scholars, emerging and midcareer artists, and graduate students. Particularly welcome are proposals that highlight interdisciplinary work. Artists are especially encouraged to propose sessions appropriate to dialogue and information exchange relevant to artists. Sessions selected by the Annual Conference Committee for the 2016 conference are considered regular program sessions; that is, they are 2½-hours long, are scheduled during the eight regular program time slots during the four days of the conference, and require a conference badge for admission. With the exception of the Open Formats category, CAA session proposals may not be submitted as preformed panels with a list of speakers. Proposals for papers for the 2016 conference are solicited through the 2016 Call for Participation, to be published in March 2015. For more information about session proposals for the 2016 Annual Conference in Washington, DC, please contact Lauren Stark, CAA manager of programs, at 212-392-4405.